As with any good wine, these engraved engagement rings only get better with time. Hand engravings along their foundations elevate these engagement rings from ordinary to extraordinary, pulling inspiration from nature, vintage styles, and heirloom treasures. Give her a ring she’ll fall in love with when you choose one from this collection of Icing On The Ring engraved engagement rings. These aren’t cookie-cutter rings by any means; etchings along the bands of these rings help create stunning details that make them truly unforgettable. When you choose one of these etched engagement rings for your sweetheart, it shows that you’ve put a lot of thought into your special moment. Take the leap and start the next chapter of your life with one of these gorgeous Icing On The Ring creations. With our engraved rings, you get the added details that take a typical ring and transform it into a treasured heirloom. While some of today’s rings are lacking in character, that’s never the case with Icing On The Ring. Each one of these styles features gorgeous accents with details inspired by vintage designs or natural elements. These are rings that are sure to impress your betrothed and everyone else. 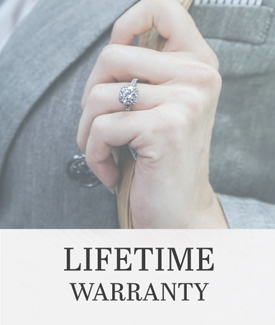 Though all of our engraved engagement rings are sure to delight that special someone in your life, it’s important to take personal style into account when choosing a ring. That’s why we offer these styles in a variety of popular tones, including rose gold and white gold. You can choose a platinum engagement ring with a look of luxury or opt for yellow gold to radiate vintage style. We offer simple solitaire gem styles along with glamorous rings featuring accent stones along the band. With plenty of options, it’s easy to find an etched ring that suits your sweetheart’s tastes. Get an elegant engagement ring featuring the highest quality in design and craftsmanship when you shop online at Icing On The Ring.